There's so much more to this huge topic than most purchasers of salmon fly lines or even tackle dealers understand. Only those who are fully engaged in salmon fly fishing as a career will be aware of the following points I'm about to raise as they will also have likely been involved in prototype design and fly line testing at some point in their professional careers. The above Monteith Multi Tip salmon fly line actually won the 'most popular Spey line' award on the UK's main salmon fishing forum shortly after this masterpiece was launched in 2006. The reason this happened was solely because there was 18 months between the concept and the finished article and multiple re-adjusting of prototype tapers throughout that period. The simple fact this happened was that a dangerously focussed and borderline obsessed fly fishing mind was fully engaged in an attempt to create a product that would be totally appreciated by the Scottish salmon fly fishers. At that time the Rio Windcutter was the leading product and whether they admit it or not they mysteriously changed their product from an ugly short rear taper to a 12ft rear taper to match other features of my superior product shortly thereafter. I designed registered the three length use feature of this product with the Patent Office and built in factory welded loops to save salmon anglers the 'hassle' of having to spend £125 to then have to go and fix braided loops on their sinking tips which had been the case at that time with Rio. I also made sure that there was enough bulk at the front end of this line to turn over with 'authority' any of the fly line tips that were supplied with this line system. This beefed up front end feature alone went down a treat with many thousands of salmon fly fishers as for the first time anglers had an elegantly tapered Spey line that could turn over proper braided core tapered & balanced sink tips without having to cut back the front end of their full floating & delicately front tapered Spey lines. I recall on the Tay many anglers who came to fish with me (before they even wet a fly) their reel line colour had changed from yellow to sky blue making the fishing hut bin always full of short yellow pvc strands! Airflo at that time were just in the process of developing ground breaking fly line technology following years of producing lines that had core memory issues. Richard Wothers who is still in charge of design & production in Brecon was amazing to deal with all through the process of creating this line. All the latest technology that Airflo had developed was offered and was therefore incorporated into this ground breaking product. Tough as nails polyurethane replaced soft and easily damaged PVC along with a low stretch braided core which took the 'elastic band' effect out of the line and help assist long range effective hooking and retain line energy. Even after all these years I still get emails from anglers wanting to buy new lines and new sinking tips even though I don't carry stock these days. The next time you consider a salmon fly line think about other design aspects such as arial elegance & sub surface profile. Even the black tube head marker on this fly line was intentionally designed to click the top rod ring on fishing days where the sun was in your eyes as a 12 inch head marker sleeve represents 2 inches to the eye when pointed downstream in bright light conditions. The shooting head era was the only reason I stopped a few years ago supplying these beautiful & well thought out salmon fly lines. The shooting heads although effective are horrible in the air and difficult to control your salmon fly with at range due to the super thin and less manageable running line that accompanies them. The arial performance of these nasty things is often as elegant as a 'brick on a string' however the low price point of £40 a head plus your running line at the same price again tricked the masses into believing this was a cheaper option even though it definitely was not by the time enough weighted heads were purchased. Don't be surprised if the product is relaunched in 2018 with the exact same original main body line specification as before but this time with 3 main 12ft sink tips instead of 8 tips as before. I'll leave it to the fly fishers to decide which if any additional tips from 10ft to 20ft at £15 per tip they'd like to purchase for a specific river's salmon pool application. The 3 main 12ft tips will allow me to retail this 'relaunched' Speyline product at a 'competitive' RRP with a serious price story against 'shooting heads' which will also cover most salmon fishing 'fly depth' applications. 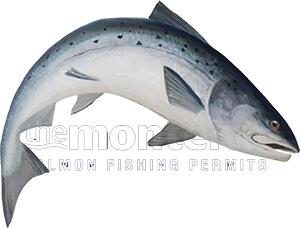 The above is just another perfect example why you should consider purchasing your salmon fishing permits through this website as I'm a truly knowledgeable and 'highly experienced' professional ghillie and not just an order taker who can offer no detailed accurate advice on any aspect of salmon fishing. I could write a book on fly line design and many other relevant aspects of this fine pursuit and you can only get to these levels of thought when you've personally spent decades on the riverbank observing everything that goes on within every aspect of this business.